These high school regrets have nothing to do with prom. April isn’t just about the bunny — it’s about the money, too. During this year’s Financial Literacy Month, an observance created by Money Management International, Americans across the country focus on what they can do to travel the path of financial wellness and better stabilize their overall financial position via education. In the spirit of expanding those mental money horizons, GOBankingRates asked more than 5,000 Americans to share what they learned about money and finances while they still were in school. Take a deep dive into what they had to say — and you might just learn a tip or two yourself. 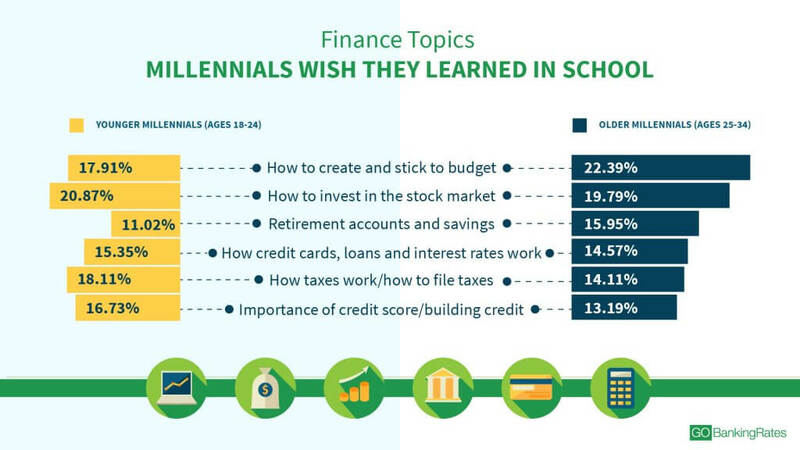 Overall, more than 44 percent of those polled responded that they wish they had learned more about budgeting and investing while they were in school. Regardless of age, roughly 20 to 24 percent of respondents were left wanting to know more about investing in the stock market, while about 18 to 25 percent wanted more knowledge about budgeting. This applies across genders, too, with male and female respondents offering strikingly similar results for budgeting. This should come as no surprise, as 2016 data from U.S. Bank found that only 41 percent of Americans use a basic budget at all. 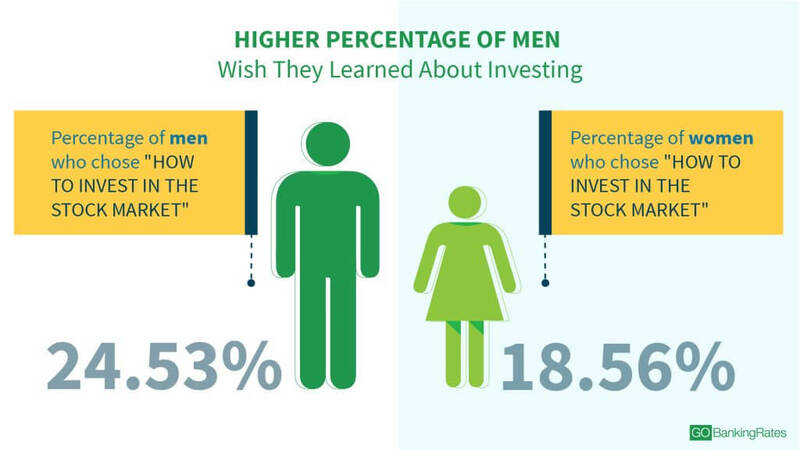 Men seem markedly more interested in stock market investments than women, to the tune of a nearly 6 percent difference. A 2017 GOBankingRates survey found data that might provide some insight into this disparity. When asked to share their biggest money regrets, 41 percent of female respondents chose not saving enough money, compared with 33 percent of male respondents. Meanwhile, only 9 percent of women said “not investing in the stock market,” compared with 15 percent of men. Here’s a more detailed look at how men and women responded to the survey question. The popularity of budgeting in these responses indicates that many Americans are unhappy with their personal money-management skills. For young millennials ages 18 to 24, taxes seem to be a sticking point. 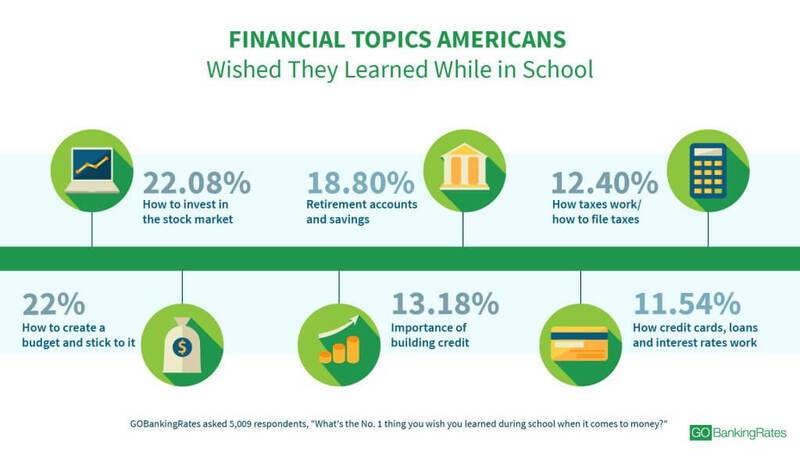 While most still wanted to learn more about the stock market in school, “how taxes work/how to file taxes” was the second most popular answer in this age group. In fact, this younger age group is more likely than any other generation to choose this answer. In terms of taxes, a 2016 USA Today report found that millennials fear tax season more than any other age group, with 80 percent of taxpayers between the ages of 18 and 34 reporting they’re fearful about some aspect of preparing their taxes. 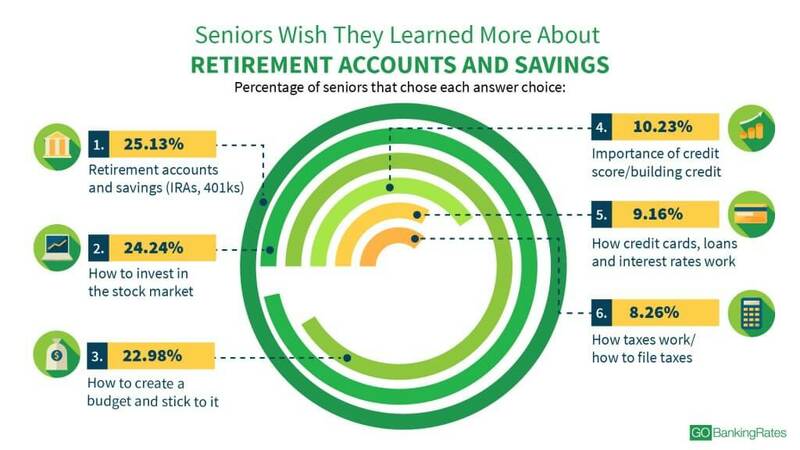 On the other end of the spectrum, they’re least likely to choose “how to create and stick to a budget” and “retirement accounts and savings” compared to other age groups, with the latter answer choice being the least popular answer choice among the age group. Here’s a deeper look at how each age group responded to the question: What’s the No. 1 thing you wish you learned during school when it comes to money? While only 11 percent of millennials wish they had learned about retirement and savings options such as IRAs and 401k plans, one response becomes more common with age: Nearly 17 percent of 35- through 44-year-olds and over 25 percent of those 65 and older wish they had learned more about these retirement options while they were in school. The data found that a startling 42 percent of Americans have less than $10,000 saved for that stage of their lives. In fact, 13.7 percent of Americans have nothing saved at all. Should Personal Finance Be Taught in Schools (or Elsewhere)? In 2018, the Council for Economic Education found that only one-third of states require students to graduate having taken a personal finance class during their K-12 education. The study also found that only 16 states require testing for economics, and only seven states mandate testing for personal finance. What’s more, no states have added personal finance to their standards since 2016. Last year, the Center for Financial Literacy at Champlain College in Burlington, Vt., graded schools across the country on their efforts to improve financial literacy in the high school classroom. While 37 percent of U.S. states received a “B” grade and 10 percent received an “A,” 30 percent of the states received a “D” or “F” rating based on hours of instruction. But what happens when those calls ring true? While finance is notoriously non-intuitive for humans to learn in a classroom environment and is becoming increasingly complex to navigate overall, our friends in Canada have addressed their similar financial literacy issues by focusing on educating people with the right skills at exactly the right time, offering more guidelines, explanations and rules of thumb during major financial decisions, such as mortgages. By offering additional information just in time to make a choice, this method of education is leading to better outcomes. Maybe it’s time for Americans to take a cue from the North? Are you financially literate? Take this quiz to find out. Methodology: This GOBankingRates survey posed the following question to 5,009 Americans: What’s the No. 1 thing you wish you learned during school when it comes to money? Respondents could choose one of seven answers: 1) How credit cards, loans, interest rates work, 2) How taxes work/how to file taxes, 3) How to create and stick to a budget, 4) How to invest in the stock market, 5) Importance of credit score/building credit 6) Retirement accounts & saving (IRAs, 401ks). Responses were collected through a Google Consumer Survey conducted from March 12, 2018, to March 14, 2018, and responses are representative of the U.S. online population. The survey has a 3.7 percent margin of error. Use these debt strategies to get to balance zero.